Who's that behind the tree? Lift the flaps to find all your favourite characters from the Gruffalo. 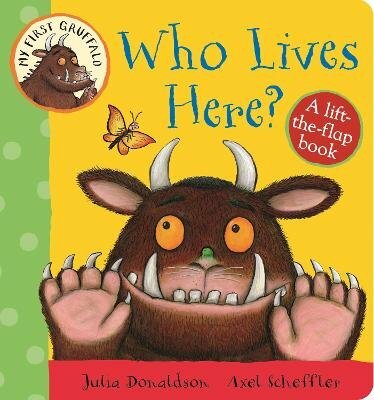 My First Gruffalo: Who Lives Here? by Julia Donaldson and Axel Scheffler is from the My First Gruffalo pre-school and baby range. A chunky board book with sturdy flaps - perfect for small paws. Also included in this exciting range is My First Gruffalo: Spot and Say, a first words board book with handy tabs.